Feyisa Lilesa of Ethiopia pictures as he celebrates as he crosses the line to win silver during the Men's Marathon on Day 16 of the Rio 2016 Olympic Games at Sambodromo on Aug. 21, 2016 in Rio de Janeiro, Brazil. The Ethiopian marathon runner who made an anti-government gesture at the Rio Games while approaching the finish line will not face prosecution upon his return home and will have "a heroic welcome," a government spokesman said Monday. But it was not clear whether the runner would go back. Feyisa Lilesa told reporters on Sunday that he may be killed or imprisoned if he ever returns to the East African country. He called protesting inside Ethiopia "very dangerous." The silver medalist crossed his wrists in an attempt to draw global attention to recent deadly protests in his home region, Oromia. He told reporters that Ethiopia's government is killing his people. "Oromo is my tribe," he said. "My relatives are in prison, and if they talk about democratic rights they are killed." The crossed-wrists gesture has been widely used by anti-government protesters in recent nationwide demonstrations as a sign of peaceful resistance, and before that by the Muslim community when it revolted against the government. It is meant to symbolize being handcuffed by security forces. Lilesa "will not face any problems for his political stance," the government spokesman, Getachew Reda, told the state-affiliated Fana Broadcasting Corporate. 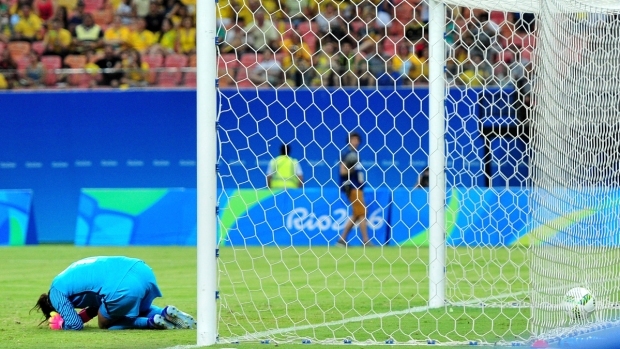 "After all, this is an athlete who secured a silver medal for his country." Lilesa told reporters that he would discuss what to do next with family and friends. 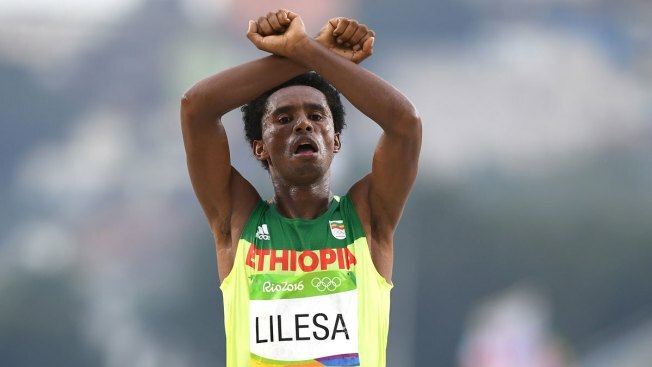 Ethiopia's state broadcaster, EBC, did not re-broadcast images of Lilesa's gesture. Some people who were watching live and cheering for Lilesa quickly hushed when they saw his gesture. The Oromo are Ethiopia's largest ethnic group with about 40 million people. Their region has seen massive anti-government protests since November 2015 that activists say have left more than 400 dead. The protests were ignited by the government's decision to annex some Oromia land into the capital, Addis Ababa. The plan has been abandoned, but demonstrations calling for wider freedoms have continued. Ethiopia's government, a close security ally of the West, is often accused of silencing dissent, even blocking internet access at times. Earlier this month, video obtained by The Associated Press showed Ethiopian security forces beating, kicking and dragging several protesters during a rare demonstration in the capital.